The European Commission has opened an in-depth investigation into Apple’s corporate tax affairs on suspicion that the company did not pay its fair share of income taxes. “It cannot be accepted that large companies do not pay their fair share in taxes,” Joaquín Almunia, Commission Vice President in charge of competition policy, said Wednesday. Under the EU’s state aid rules, national authorities cannot take measures allowing certain companies to pay less tax than they should if the tax rules of the EU member state were applied in a fair and non-discriminatory way, he said. 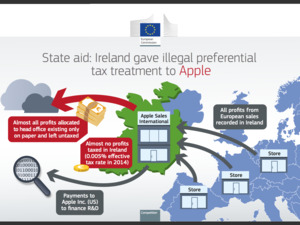 The Commission will examine whether the Irish tax authority required Apple to pay sufficient income tax under EU rules. The Commission started similar investigations into the taxes paid by two non-tech companies in two other EU member states widely viewed, like Ireland, as being low-tax jurisdictions: Starbucks in the Netherlands, and Fiat Finance and Trade in Luxembourg. Opening an investigation gives interested third parties and member states the opportunity to submit comments and does not prejudge any outcome, the Commission said. The investigation was started following several media reports alleging that companies received significant tax reductions from national tax authorities. These decisions may be seen as state aid under EU rules if they are used to provide selective advantages to a specific company or group of companies. Preliminary analysis has shown that this might have been the case for Apple in Ireland, the Commission said. “We have received no selective treatment from Irish officials,” Apple said in an emailed statement, adding that it has been subject to the same tax laws as scores of other international companies doing business in Ireland. “Apple pays every euro of every tax that we owe. Since the iPhone launched in 2007, our taxes in Ireland have increased tenfold,” it added. The probe started Wednesday is part of a wider investigation, Almunia said, adding that new investigations into tax regimes in other states may be opened. Requests for information were sent to nine member states, he said.